This morning I went to the studio to work on my self-portrait. My goal was to change the position of the mouth and chin, moving both up by about a quarter of an inch. I took along the printout of the changes I made yesterday in my little digital dress-reheasal. I brought it along less as a reference than as an object lesson in what not to do. (See yesterday's post.) Today, I started by turning the painting upside-down to redraw the lines of the mouth. (Sometimes it really helps to do that!) Yesterday I lost the line of the bottom lip, so today I painted in a new outline for the bottom lip without covering up the original line, and then did the same for the upper lip. This allowed me to keep the shape of the mouth and the basic expression, so things went a lot better than they did yesterday on the computer. However, getting the details of the mouth right was a struggle today. Then I moved the chin line up, using the same approach as with the mouth. I also moved the line of the shoulder and arm up by a quarter inch. Well, I was surprised, pleased, and extremely relieved that I had not created a disaster by making these changes! (I think I learned from yesterday's struggles.) Even though the mouth is a little different here than in the prior version of the painting, this is pretty much the expression I wanted. 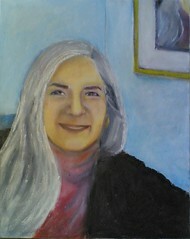 There may still be things I will want to change, but at the moment I am feeling at peace about this self-portrait. . . .